Commodity Trading News And Technical Analysis Reports. : Copper Fell As Chile cuts Production Forecast, Freeport resumes shipments & Mongolia Copper Exports Underway. Copper Fell As Chile cuts Production Forecast, Freeport resumes shipments & Mongolia Copper Exports Underway. The mine is expected to make up a third of Mongolia's economy by 2020, and at full tilt produce around 450,000 tonnes of copper and 330,000 ounces of gold a year. "Oyu Tolgoi starts production at a time when undeveloped quality copper assets are scarce and the outlook for copper continues to be strong," said Rio Tinto , which helped fund Oyu Tolgoi's $6.2 billion development cost. Journalists had been invited to attend a ceremony at the mine located 80 km (50 miles) north of the Mongolia-China border on June 14 to mark the first exports. That was postponed to June 21, but the event was again canceled at the last minute. Mongolia's mining minister has said the delay in exports was because the government and Rio disagreed on the arrangement of revenue generated from Oyu Tolgoi as well as the disclosure of the mine's $8 billion sales agreements. Freeport McMoRan Copper and Gold Inc has resumed copper shipments from its Grasberg mine in Indonesia as it restarts open-pit and underground mining, but expects output this year to drop by a fifth following a near two-month stoppage. A training tunnel cave-in killed 28 people at the world's second-biggest copper mine in May, shutting operations across the mine site while safety investigations were carried out. Freeport had sent two shipments of copper concentrate to refineries in Indonesia and China since June, well below its normal 10 shipments a month, the company said. Chile, the world's top copper producer, said Tuesday it expects to produce 5.53 million metric tons of the red metal in 2013, down from its previous forecast of 5.58 million tons, which was announced in April. The price of copper, a barometer for the health of the global economy, has fallen about 15 percent this year. Its price on the Comex has fallen from nearly $3.80 per metric ton in February 2013 to $3.05 on Tuesday -- a 19 percent drop in slightly more than four months. The government's copper commission, known as Cochilco, also cut its average copper price forecast to $3.27 per pound compared to the previous level of $3.57 per pound as a result of a slowdown in purchasing activity from the world's top metals consumer, China. 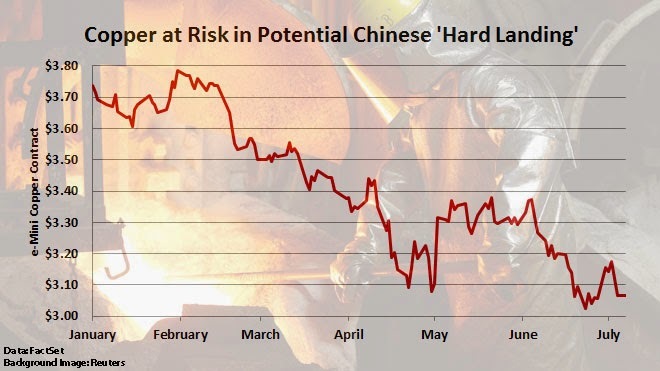 The price cut is also influenced by the prospect of the U.S. Federal Reserve winding down its economic stimulus program -- and thus potentially trimming U.S. economic activity, including demand for copper -- as well as a projected copper surplus in the coming years.